4) our selected Guests are used to stay in a comfortable and silent atmosphere. For this reason, we ask groups guarantees of a proper behavior during day and night time. With the sole object of preventing noise and damages, at the arrival we'll ask the teacher/group-leader a security deposit of 25 euros per person which we'll refund you before departure in case of no damages. 5) all rooms are provided with private bathroom and shower, tv, bed linen, terry towels, shampooing. Laundry facilities are at guests' disposal at small additional costs. Rooms are cleaned daily. Luggage storage service available at departure. 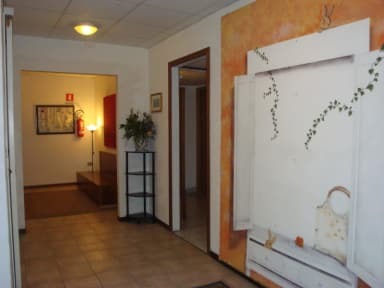 Unique amongst the hotels in florence, Youth Residence Firenze 2000 is only a few minutes from the historic areas of san frediano and santo spirito and can easily be reached from the train station, santa maria novella (approx. 15 minutes on foot without luggage). Completely renewed, all our rooms are for private use, provided with private bathroom. It's not possible to book 'the bed', we don't have dorms or rooms to share. Indoor bar/café, TV in rooms, outdoor patio area. Italian Breakfast included: from 8am to 10am. Reservations can be cancelled without penalties until 3 days before the arrival date. If not, we charge the first night on the card. We accept guests younger than 18 years old only if with parents or on a school trip. Features: all rooms are private (no rooms to share), provided with private facilities, terrytowels, courtesy products. 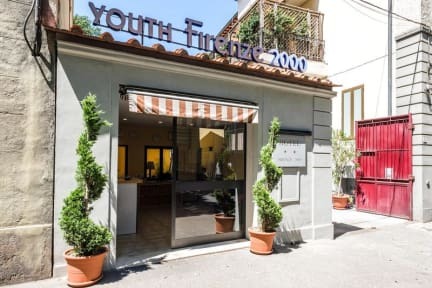 Location: youth hotel firenze 2000 is located in the historical centre of florence (san frediano area) at 15/20 minutes on foot from the main railway station (smn), Cascine Park (summer concert area), the new OperaTheatre, Stazione Leopolda and 10 minute by bus from Piazzale Michelangelo. We provide blankets, terry towels, sheets, courtesy products and rooms are cleaned daily. Clean and lovely. Great nice stay. I spent a lovely weekend in Florence, using the hostel as my base to explore the city. The staff were very friendly, polite and helpful. The room was clean and quiet so it would be perfect for someone looking for a break from typical rowdy hostels! I traveled on my own and was made to fell very welcome. Although there is a bus into the town, the walk takes only twenty minutes or so and is very pretty, walking along cobbled streets or by the River Arno, with incredible views of the city! Easy to walk to and from a lot of places. Clean rooms and friendly staff. The wifi you do have to pay for but it worked well. Had some loud neighbors all night long but that's to be expected at a hostel and it was new years weekend. The staff was helpful and called our cab the morning we left to go to the train station. About a 30 minute walk from main attractions of Florence. Quiet area. Very quiet hostel, perfect for relaxing. I stayed there after staying in a party hostel to recuperate. I only saw about 10 other residents and this was in August! Really nice and welcoming staff. The room was no thrills but it was clean and it was cleaned everyday with fresh linen and towels. Nice shower. Fast WiFi in the room. Perfect free breakfast and coffee! Perfectly average hostel. Clean but a bit expensive. You can find cheaper. Staff was friendly. Terribly slow internet. I had to go to a local restaurant to use it. Not even worthy the 1euro they charge for wifi. The room wall was thin, very noisy in weekend nights. Poor sleeping quality. Breakfast was too little and too simple. Bad location, far from tourist spots. Toilet smell a little bad, probably beacause of too old. The staff are good.